Earlier this summer, I read and loved John Belushi is Dead. It was the kind of book that took me by surprise in its wisdom and depth of characterization. After finishing it, I immediately emailed the author and asked if she'd be willing to engage in an email interview/conversation with me. She said yes, because she's awesome like that, and what follows is our conversation. Amy: Hilda and Benji have an interest and fascination with visiting the places that famous have died. Is this an interest you share? Kathy: Absolutely. I've always had morbid preoccupations. I was reading Stephen King novels at the age of nine, Fangora Magazine at twelve. In my teens I devoured horror movies, and on my first trip to Los Angeles at the age of sixteen someone pointed out to me the house where the actress Sharon Tate was murdered by the Manson Family. I then discovered a website called www.findadeath.com, a catalogue of the various tragic ways celebrities have met their demise, and couldn't get these stories out of my head. It's an interest that has definitely grown in the writing of the novel too. I wasn't particuarly interested in John Belushi when I started researching his life, but after devouring everything I could find on him I am now a firm fan. Rather than being a cathartic experience, writing this novel has turned my interest into a obsession. Amy: It's really interesting because people often think of Los Angeles and Hollywood being really glamorous, but there's a definite dark and gritty underbelly. Hilda is drawn to these stories as a way to cope with some of the loss she's experienced in her own life, and also, I think in an effort to remember those who are gone. Have you also gone on the kind of excursions Hlida and Benji go on to see the places of death? Kathy: I'd only visited a few of these places before I started writing the book, but went to many more in the course of my research. I climbed a fence to get a better look at the house where Marilyn Monroe died, and was chased off by the biggest, angriest dog I'd ever seen! The Chateau Marmont was kind enough to let me see the bungalow where John Belushi died, because I couldn't afford to stay there (it can cost thousands of dollars a night). They bellhop wouldn't comment on what had happened in the bungalow though. I think the Chateau has a policy of silence where John Belushi is concerned. One place I still haven't been that's mentioned in the book is the turnpike in Bakersfield where James Dean was killed in a car crash. I'm hoping to go out there on my next visit to LA. Amy: You've created a cast of characters that is pretty richly flawed--in fact it's one of the things I like best about the book is how you manage to make them all sympathetic despite what's so unlikeable about them. Did you have any reservations about writing them with such flaws? Even the one strong memory of Hilda's parents is less than rosy...have you had any response to depicting them this way? Kathy: There was a point in writing the book where some of the characters were even more extreme than they are now, and my editors made me tone them down so they were more 'likeable.' I liked them all to begin with, because they felt real. I never once sat down and thought "oh, better give these characters flaws to make them more interesting." The characters revealed themselves to me and that's who they are, so I tried to interfere with that as little as possible. There have been some pretty strong reactions to Benji from both readers and reviewers. Some people just can't relate to him at all, and write him off as a weirdo. Others are drawn in by his confusion and pain. He's actually my favorite character in the whole novel, which I guess is pretty telling. He's trying to work things out, and going to some dark places to do it. That's almost admirable in a way. Almost. You're Australian and the book is set in Los Angeles. Your bio says you divide your time between the two. How did this story come to you and why choose to tell a story in LA as opposed to Australia? Kathy: I first travelled to Los Angeles when I was sixteen and fell in love with the place. I've always been a big movie buff (I work in the film industry as my day job) so it's natural I'd have an affinity with LA. When I am away from LA I really miss it, and I think writing about the place is a way to feel like I am still there. My stories also deal with pop culture and celebrity, so LA is the ideal setting for them. There is, of course, no way that John Belushi is Dead could have been set in any other place. If the right story comes along that's set in Australia, then I'll write it, but for now my literary heart belongs to LA. Amy: Yes I agree that Los Angeles is an essential character in the book! What has been your favorite part about writing a book and being an author? Kathy: The best part, apart from the writing itself which is fulfilling in ways I can't even begin to express, has been the opportunity to meet some of my favorite authors. Recently I spent time with Bret Easton Ellis on his "Imperial Bedrooms" book tour, which meant a lot to me because he is my all-time favorite author (along with Stephen King). You can read the interview I did with Bret here. The original Australian title of the book is Hollywood Ending and the US name is John Belushi is Dead. What do you think about the name change? Kathy: I love both titles, probably because I came up with them! I always used to say if I had a rock band it would be called John Belushi is Dead, so having a novel called that is pretty sweet. Amy: You did? That's really cool. Is there a reason you went with different titles for the different countries? Kathy: Different titles work for different markets. It was the publisher's decision - I'm not fussed either way. Amy: The YA market is vibrant and growing. 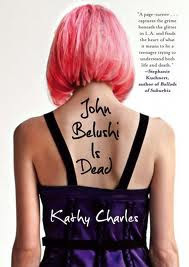 Do you read other books in the market and what are some titles you might recommend to fans of John Belushi is Dead? Kathy: I love Simmone Howell. If you haven't read "Notes from the Teenage Underground" I urge you to run out and get a copy immediately. My favorite YA author is Paul Zindel. Someone mentioned in a review that my novel reminded them of Zindel's The Pigman, and when I read it I was astonished at how similar our themes are. Since then I have devoured him and continue to. His novels are so powerful they leave me shattered. Another favorite YA novel I read recently was "Someday this pain will be useful to you" by Peter Cameron, which is about to be made into a film. Amy: I will definitely check those out. Thanks so much for taking time out of your busy schedule to do this interview, Kathy! One last question...are you working on anything now and can you give us a hint? Kathy: I'm working on another YA book set in Los Angeles. That's all I can say at this point! I haven't seen a lot of coverage of John Belushi is Dead in my corner of the blogosphere which is a shame! I really hope more of you will check it out! You can follow Kathy Charles on Twitter.